As an SMS marketer, part of your campaign’s effectiveness lies in the time at which your recipients receive your SMS. Timing your campaign smartly will yield better results and allow you to gain more sales leads. If mismanaged though, you could end up with the reverse effect by sending your SMS campaign at an unwelcome time. We all understand the serious implications of disgruntled customers on your business reputation. Just like you would not ring somebody in the wee hours of the night, you should also take measures to prevent your SMS being received in that period as well. To make this process easier, the SMS Marketing app has been updated with a Responsible Marketing feature. 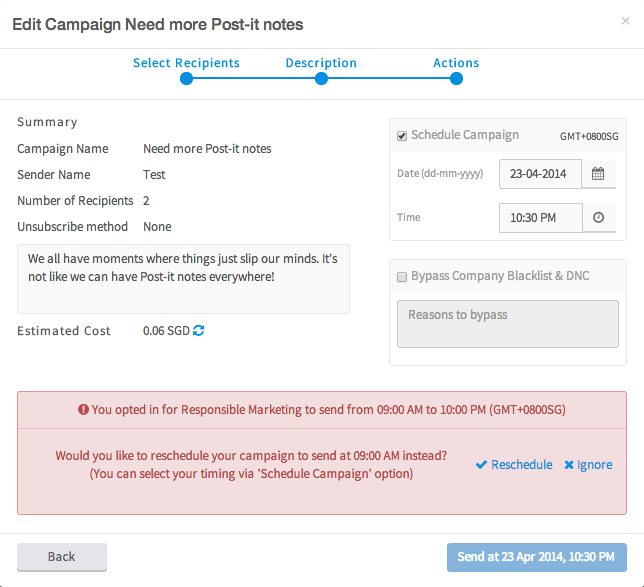 This tool allows you to manage the time at which you send out your campaign. 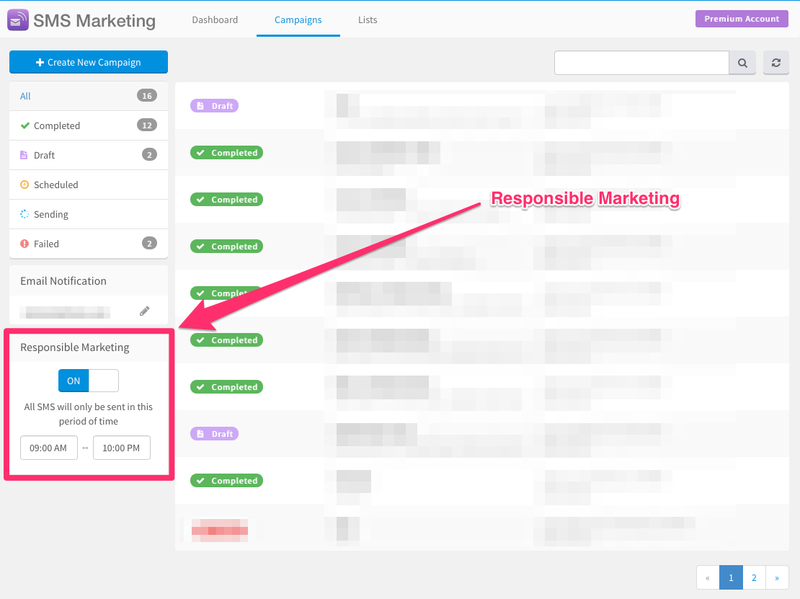 The Responsible Marketing button acts like a wingman. It helps you avoid the mis-step of sending your campaign out when the customer is most likely resting or asleep and would therefore not appreciate your incoming SMS. After all, if that happens, it won’t matter how well-crafted your campaign message is. By switching on this feature, messages will only be sent out within that time boundary. (For SpiderGate users, any unsent messages due to DNC screening will be queued, and sending will resume after the quiet period ends.) Quiet time has been set by default from 10pm to 9am as a recommendation, and you can configure the time frame to better fit your industry practices. Here’s how it watches your back. We all have moments where things just slip our minds. It’s not like we can have Post-it notes everywhere. If by any chance you accidentally schedule your campaign to be sent out during the quiet period, Responsible Marketing will alert you to it. After this reminder, you can either re-schedule your campaign or proceed to send anyway. We retained the latter option because the Responsible Marketing feature is meant as a helpful tool, rather than a hard and fast rule. You even have the option to switch it off if you prefer. With the DNC ruling shrinking the available target market, it’s undeniably made the job of telemarketers and SMS marketers more challenging. That’s why it’s more necessary than ever to take extra care in crafting your campaigns.